In the previous three chapters we have presented the arguments by which we associate radiation-induced DNA double strand breaks with cell reproductive death, chromosomal aberrations and somatic mutations. These arguments have led to the development of mathematical equations for the description of the dose relationships for these three different biological end points. They have also led us to consider the different biological and molecular mechanisms which are involved in the development from the initial radiation-induced lesion to the ultimate expression of the biological effect. 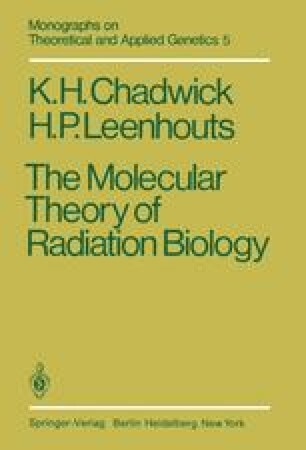 In this chapter we show that because we have proposed, as a basic tenet of the molecular theory of radiation action, that each of the three different biological end points can develop from the same type of lesion, the double strand break, a number of consistent mathematical correlations must exist between two or more different end points which are determined in the same experiment. We also present relevant experimental data to demonstrate that in suitably designed experiments these predicted correlations can be measured.